Eurocom is shipping the NVIDIA GeForce GTX 880M in single and SLI (Dual) configuration in the line of fully configurable, VGA upgradeable, high performance gaming laptops. 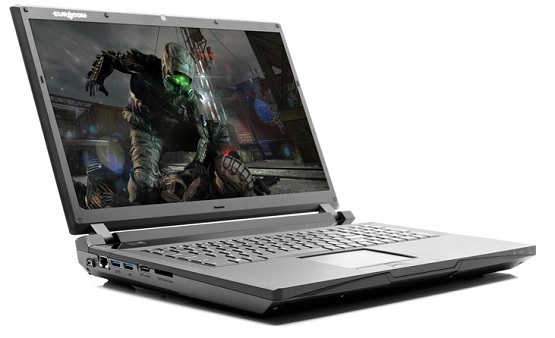 The addition of the NVIDIA GeForce GTX 880M, the highest performance mobile solution from NVIDIA, gives Eurocom customers an even greater choice of GPU’s to power their gaming laptop with a graphics card to fit every performance level. “Eurocom created the X series of gaming laptops so our gaming clients can could discover their dark side, the performance, capability and design are unmatched” Mark Bialic, Eurocom el Presidente. The NVIDIA GeForce GTX 880M graphics card has 1536 CUDA cores running at 954 MHz + boost with 8 GB GDDR5 memory running at 2500 MHz. In SLI the two 880M graphics cards offer users up to a whopping 16 GB DDR5 video memory and 3072 CUDA cores giving Eurocom users simply epic performance. The 15.6” EUROCOM X3 and 17.3” EUROCOM X5 and X7 are equipped with high resolution 1920x1080 FHD displays, upgradeable Intel Core i7 extreme processors, next generation NVIDIA GeForce GTX 880M graphics, multiple storage options (up to 5 physical drives) and up to 32 GB of DDR3-1600/1866 memory. Enjoying the latest content is all about visuals. The Eurocom line of high performance Gaming Laptops support beautiful full high definition 1080p 1920x1080 matte and glossy displays with the option to go with a fast refresh 120 hz panel. Personalize your own Eurocom laptop weapon with a custom backlit keyboard, with 7 colours, 3 zones and 8 modes you have the ability to dominate and stand out.